I love hops. From my first Stone IPA back in 2001 to now I’m a devout hop head. This year, in order to increase my love and understanding of the dozens (hundreds?) of hop varieties available I decided to undergo a project and brew a series of simple saisons that highlight different hops and even some experimental hop hybrids from the 2013 harvest. 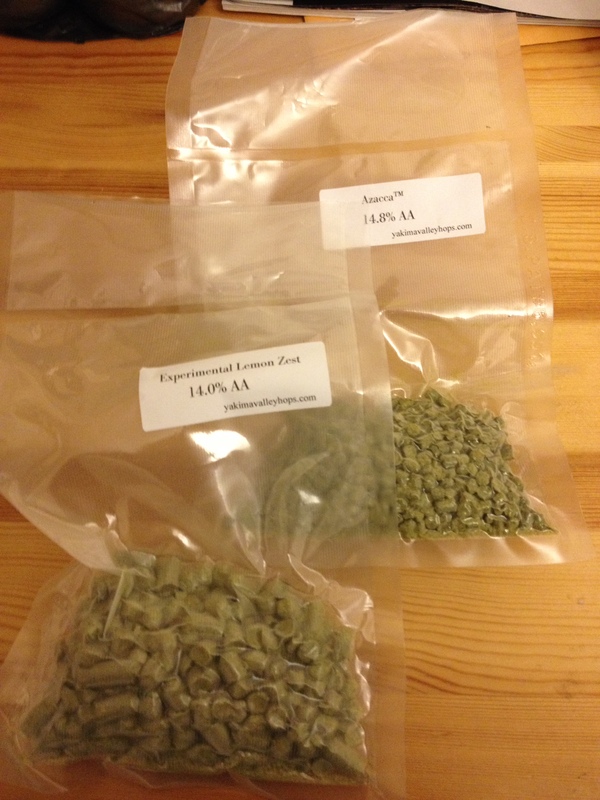 I sourced my experimental hop varieties from Yakima Valley Hops (my favorite hop supplier). I started out the year with the ambition to do 5 varieties of experimental hops, and that increased to 6 as a few more became available. I added these hops at the end of the boil, at 10 minutes and then dry hopped with the same variety. The beers were bittered with a standard CTZ or sometime nugget hop (at 60 minutes…no flavor contribution). I kept the brewing, fermentation, and grain bill the same (or as similar as possible) for all 6 of these beers as well as the hopping schedule. This post is a summary of my experience with the different hops and my thoughts / recommendations for their use in future beers as a flavor / aroma hop. The six hops I used this year were, Azacca, Experimental Pine Fruit, Experimental Lemon Zest, Experimental Grapefruit, ADHA 484, and ADHA 871. So a little primary information about the hop varieties to start out. Information from supplier is in italics, my notes on each of the hops are in plain text. They are presented in the order in which I brewed. Other Notes: Sounds like this is the best-suited of this new lot (from the ADHA) for American IPAs, so it’s no surprise that it’s the first to get an actual name. This hop is great for a late addition aroma hop, it had a nice floral character. It is relatively subtle so you can use a lot to get the right level you want. I’ve had about half-a-dozen beers that use this hop and it is distinct, easy to pick out, and seems to pair well with the Simcoe / Mosaic varieties of hops. rind, “Simcoe like”, “Summit like”, citrus, tangerine. Very aromatic hop, really strong. This is probably best described as a more fruity Columbus or CTZ variety. You definitely get that earthy resinous feel from this one, like you are chewing through the beer. The pine was forward and present and probably dominated the fruit characters. This one was a lot of fun to drink. I don’t think I’d put it too close to Simcoe though, this was more earthy than that…more pungent. Comments: Pleasant, mild citrus aroma. This was a fragile hop, the lemon character lasted only a week or so, then faded quickly. I was left with a saison with close to no hop character. It didn’t devolved into something undrinkable…just something plain. Maybe this would work well in combination with other aromatic hops, something that could complement lemon well. Also “Lemon Zest”?….maybe “Lemon Grass”…it definitely had a citrusy sense to it but not zest. To level with you immediately, my least favorite. This should be a bittering hop. There are no dominant flavors present in this one, pretty boring honestly. Not a repeat for me. Characteristics: Cedar, wood, bubblegum, spice. Other Notes: Intriguing descriptors here. Sounds appropriate for English beers, or oak-aged beers. This one doesn’t even get a name. It is a subtle simple hop. It worked OK in the context of the saison but there is nothing too special here. I didn’t dislike it, the lack of name removed any preconceived notion about what it could do, it is a fine hop. Think English beers or Noble hop variety here. Could be used in place of any of those. A pleasant surprise and my final variety I used. This turned out near perfect for a saison. Overall a nice hop to use for aroma / late additions. It was tea-like with some subtle citrus and floral notes. I’d use it again, maybe this one will get a name. Numbers are just numbers and you have to be pretty into hops to glean much information from those, I just include them in there so in case you do want to know the different acids and oils, there they are. People primarily are concerned with how the hops preform in the beers themselves. So I’m going to summarize my favorites, least favorites, and the rest for you right now. Experimental Pine Fruit – this was the most aggressive hop out of the bunch. It was incredibly resinous, flavorful, aggressive. It completely dominated the beer…in a good way. It was like drinking grapefruit juice…really bitter grapefruit juice…this is a definite repeat hop of mine and I hope it is around to stay. Amazing hop…truly amazing. Azaccca – This was the first hop of the experiment and when I ordered it, it was just a number…it was named “Azacca” shortly after that. This was a good one to start out with, it was pretty floral. I think a different yeast could have been better with it but overall I loved that beer and it cemented in my mind that I was doing the right thing. ADHA871 – A pleasant surprise. Not my favorite of the year but the first few weeks this was on draught at my house, this was really incredible. Paired amazingly well with the saison yeasts (so I guess I got lucky there). Over a few weeks, the hop aroma started to fade and left me with a pretty bitter saison, but I don’t mind. Probably a fragile hop but still a good one. Experimental Grapefruit – maybe it’s just me, but if you call something grapefruit, it should taste like grapefruit. This was the biggest disappointment of the year…it just didn’t live up to the expectations outlined in the blurb on the website. Maybe I did something wrong, or maybe it would work in a different kind of beer. This was my least favorite out of the six. Experimental Lemon Zest – Again, more lemon if you are calling it lemon. This started out tasting like lemon, a week later…just a regular hop. It was interesting but overall not going to be a repeat for me. So what’s next…..How about 6 more? Well, I’m going to continue this experiment as long as I can get my hands on experimental varieties of hops. And, from the 2014 harvest, I got 6 new varieties already. They are: Nuggetzilla, J-Lime Experimental, Chocolate Experimental, Otto Supreme Experimental, Vinnie Special Experimental, and Armadillo Experimental. I’m excited about all of these. There is going to be several differences between the six saisons I made this year and the 5 I’m going to make next year. The first being the hops, all 6 saisons described above were pellet hops, five out of the six from the 2014 harvest are leaf (Nuggetzilla is in pellets)…so I’m already starting out different. Leaf were the only form available this year, that’s fine. I’ll adapt. Second, I’m going to use the Blaugies yeast with no Brettanomyces for these new 5. I want a cleaner beer that showcases the hop better…I think that yeast is the better choice moving forward. Last, I’m going to use more of the hops and be more aggressive getting at the flavor and aroma of these hops. This means, more dry hopping, better dry hopping, and dropping the bittering addition altogether to make these truly single hop saisons. Here’s the setup. I want to add 2 ounce of each at 10 minutes before flame-out into the wort. I am currently constructing a hop-back out of a large jar so I can drain the hot wort through the hopback filled with approximately 2 ounces of whole leaf hops on the way to be chilled but the chiller. After fermentation, the beers will be double dry hopped in a CO2 purged, dark, corny kegs. I have researched a setup that will allow me to dry hop in the keg without clogging the dip tube or utilizing a hop bag. I’m still in the process of setting this up. Basically, it involves making a metal sleeve for dip tube in the keg so the hop leaves can be in solution, floating around without a chance of them clogging the tube. I’ll build two of these kegs and dry hop in one in a CO2 purged tank under light pressure, then transfer under CO2 to a new keg with an additional 2 ounces of hops. Each 5 gallon batch will get 8 ounces of whole leaf hops in the end, all late additions and dry hopping. This will slightly increase the time it takes to make each batch (by a week or so) but I think it is important to make a more honest effort getting at the essence of this hop. I will also be transferring the beer under CO2 pressure from the carboy into the kegs. Obviously the goal here is to maximize the hop presence in these beers. These will be CO2 purged, dark fermented, double dry hopped, single hop saisons….this is going to be incredible (I hope). If you are in the greater DC Area and would like to be part of this experiment as a taste tester. Please contact me through this blog. Nice summary. I brewed a Saison with almost all-Azacca (based on Oxbow Saizacca), and really liked the hop character in that one (unfortunately, most of the keg leaked out in my keezer). I then used the hop in a Red IPA, paired with Simcoe and Amarillo, and it worked really well with those two hops as well. Awesome summary and great blog! Have you been able to get your hands on any of the chocolate experimental yet? I saw that Yakima Valley has them, and I also noticed a chocolate coconut variety from Hops Shack in Ohio. I’m putting together a Mexican Hot Chocolate Porter soon for (hopefully) fall release. I’ll be posting the results on my blog then as well. I do have the chocolate hops. They are whole leaf so I’m altering my process slightly after I get through the pellet hops. I just tapped ADHA527, post on that later this week, then one more pellet hop and then the chocolate hop. Chocolate coconut sounds crazy. I’ll look into it. Great entry. Any update/info on Otto Supreme? I have some of these and can’t find much info on them.